In one week or so, many of you will be heading to Philly (Today’s Dietitian’s hometown) to attend the American Association of Diabetes Educators (AADE) annual meeting and exhibition at the Philadelphia Convention Center. It’s such an exciting time for dietitians, certified diabetes educators, registered nurses, pharmacists, physicians, and other health care professionals who specialize in diabetes self-management education and patient care. You’ll get to learn even more about the latest research and technological advances in the treatment and management of the disease. You’ll also get to visit with old colleagues, network with new colleagues, and explore the city’s many attractions in your free time. Expect to attend exciting keynote presentations, continuing professional education sessions, workshops, and cooking demonstrations. I’m especially excited about attending the conference for the same reasons you are. I’ll get to learn more about diabetes prevention, treatment, and management. And I’ll get to see all of you again and discuss the important topics you’d like us to cover in the magazine. So please stop by booth 814 and say hello. 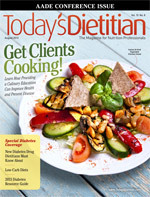 In this issue, Today’s Dietitian features special diabetes coverage. The article “Shifting Directions” discusses the new FDA-approved drug canagliflozin, the first in a new class of medications that targets the kidneys to achieve glycemic control in adults with type 2 diabetes. In the Dynamics of Diabetes department, we discuss the benefits of the somewhat controversial low-carb diet for treating and managing type 2 diabetes. And you can earn two CPEUs by taking the course “Gestational Diabetes.” You’ll learn about the different classifications of gestational diabetes and the criteria for accurate diagnoses and appropriate treatment. Don’t forget to peruse the Diabetes Resource Guide, too, for products and services you can tell clients and patients about. Give us your feedback about these articles at the AADE13 meeting and on our Facebook and Twitter pages. And please enjoy the rest of the issue!